Both vehicles came to rest in the grass on the side of Loop 393 in Goodrich. Major Accident on Loop 393, GOODRICH, December 3, 2011 - At approximately 4:55 pm on December 2, 2011, a Maroon 2004 Chevy Impala driven by Angelica Flores-Reyes, 41, of Goodrich, was north-bound on Loop 393 in Goodrich when she was suddenly slammed head on by a south-bound tan 2000 Nissan Frontier driven by Trenton Delaney Robinson, 24, of Bosier City, Louisiana. Robinson reportedly attempted to cut back right to avoid the collision, but wasn't in time. 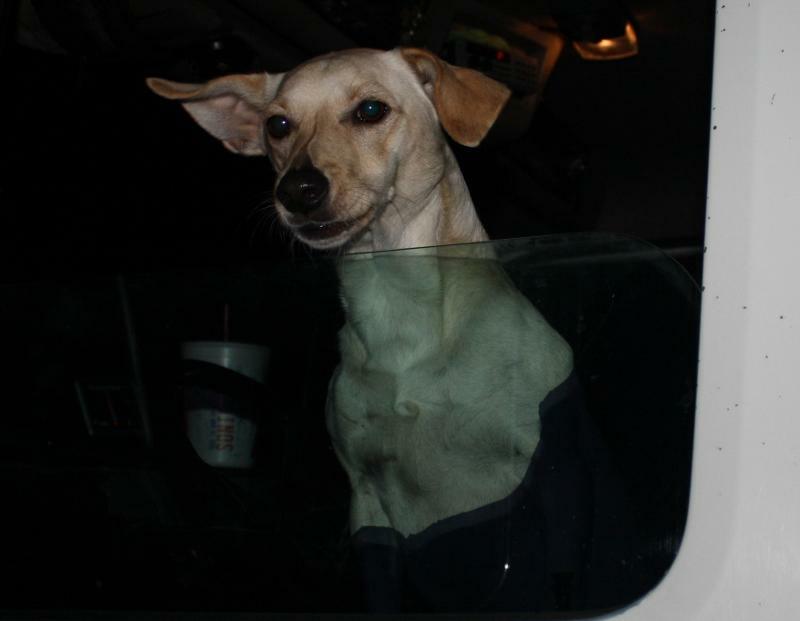 Robinson allegedly attempted to pass a vehicle in front of him when the north-bound lane wasn't clear. Both vehicles came to rest in the grass on the side of the road. 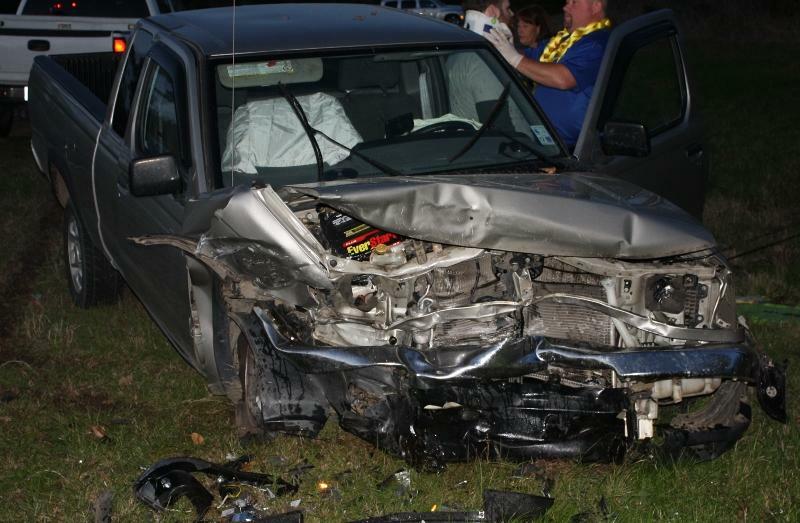 Americare Ambulance Service was dispatched to the scene along with the Goodrich Volunteer Fire Department and Troopers Donny Akers and Darwon Evans with the Texas Highway Patrol. 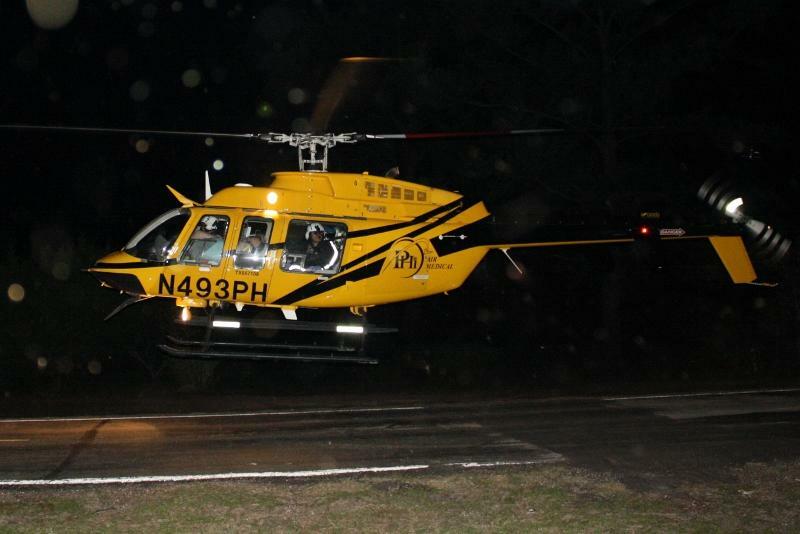 Robinson sustained serious injuries and was flown to Hermann Hospital in Houston. 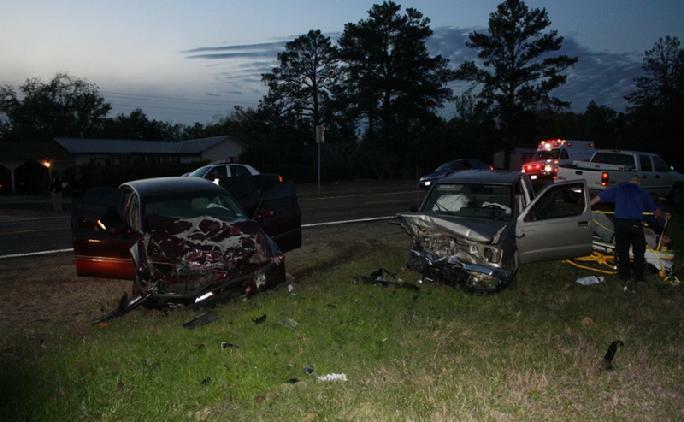 Flores-Reyes and her three passengers (all small children) were transported to Livingston Memorial Hospital with undisclosed injuries. Traffic on Loop 393 was partially blocked during investigation and cleanup. According to Trooper Akers, was cited for Passing when unsafe while Flores-Reyes was cited for no insurance and no driver's license. 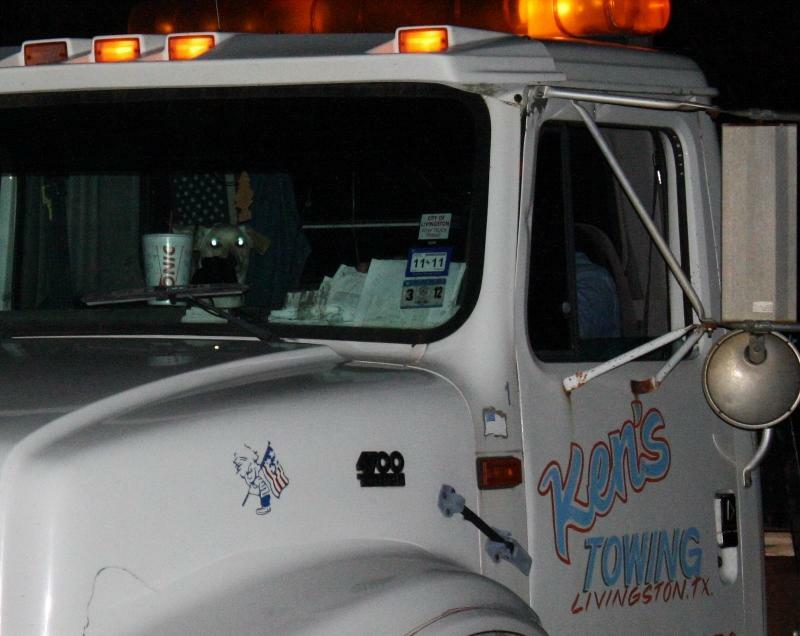 A rollback wrecker from Ken's Towing recovered Robinson's vehicle and it will be stored at Harrison Body Shop in Livingston while Flores-Reyes' vehicle was recovered by a rollback wrecker from Harwood Wrecker Service and will be stored at 101 Harwood Drive in Livingston. The scene was cleared by 6:30 pm. 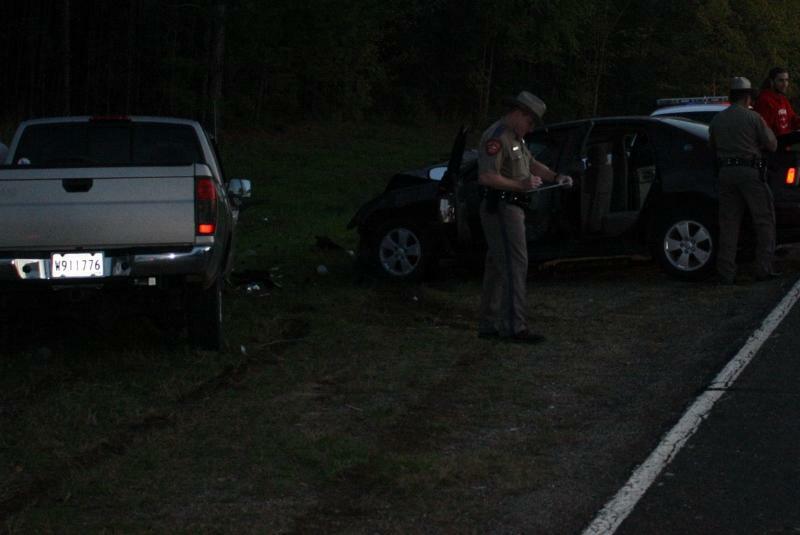 Trooper Donny Akers (left) is investigating the accident and was assisted by Trooper Darwon Evans (also pictured at right). 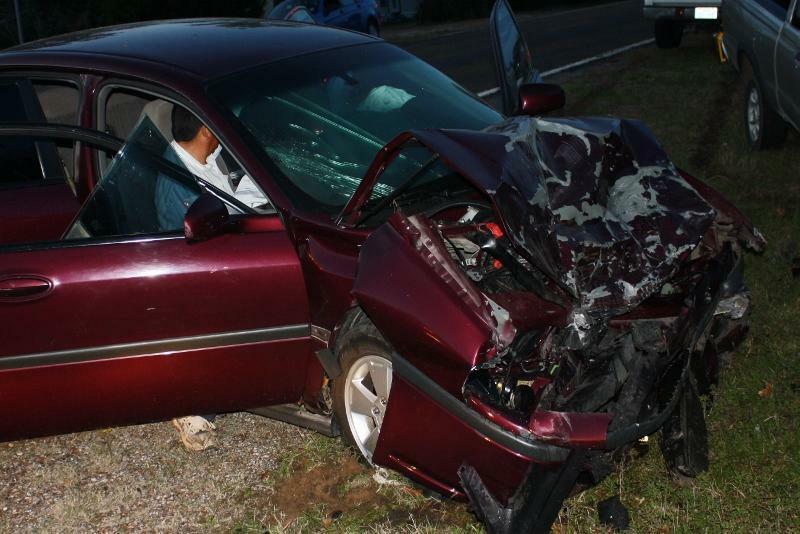 Angelica Flores-Reyes was north-bound on 393 and was in her lane when her 2004 Impala was slammed headon. Trenton Robinson was south-bound when he allegedly attempted to pass another vehicle in front of him when it wasn't clear. 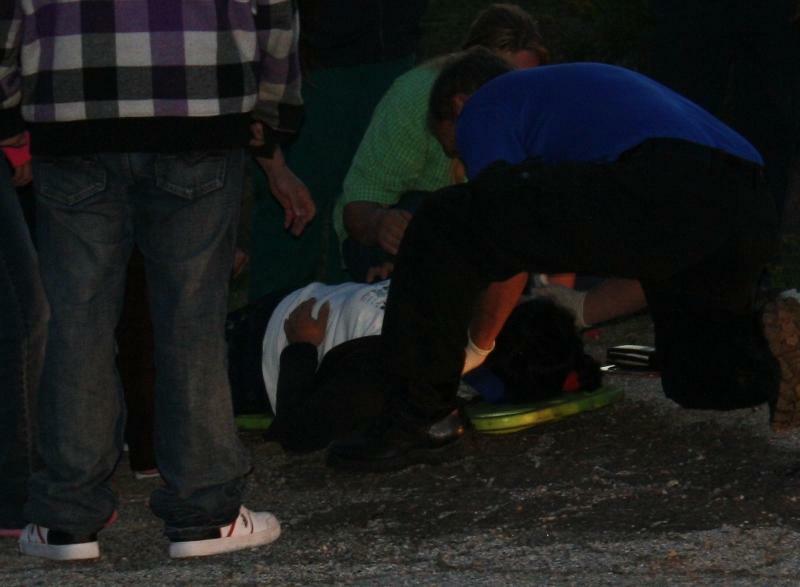 Angelica Flores-Reyes Rocio was treated by EMS Personnel before being transported to Livingston Memorial Hospital. 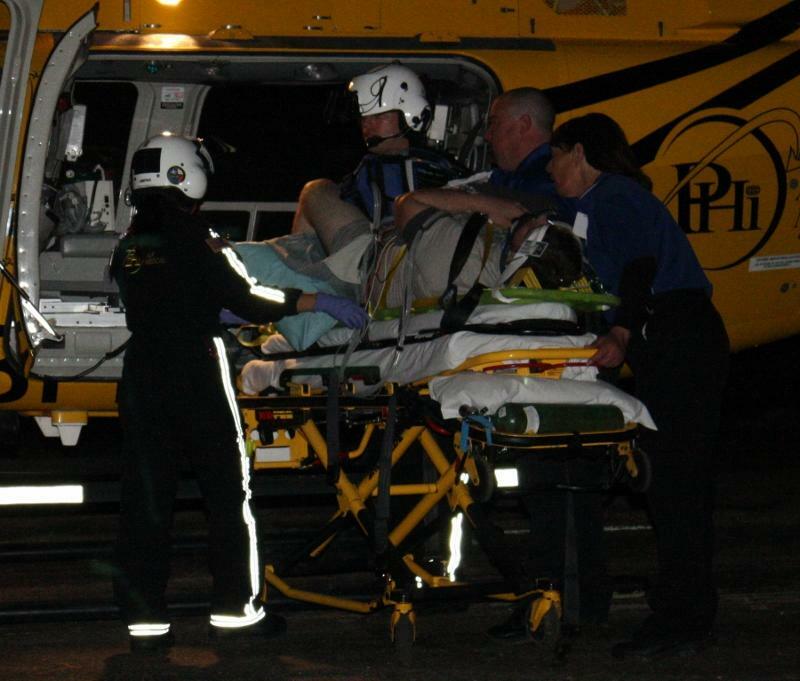 Trenton Robinson was loaded onto a PHi Air Medical helicopter and flown to Hermann Hospital in Houston. 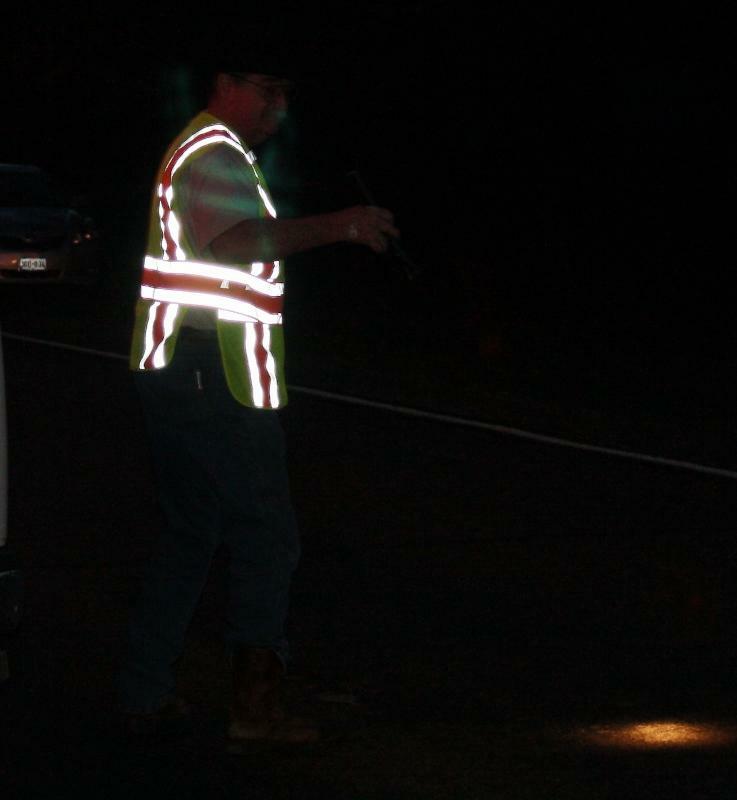 Goodrich Fire Chief, Ken Hambrick, directed traffic and offered other assistance. 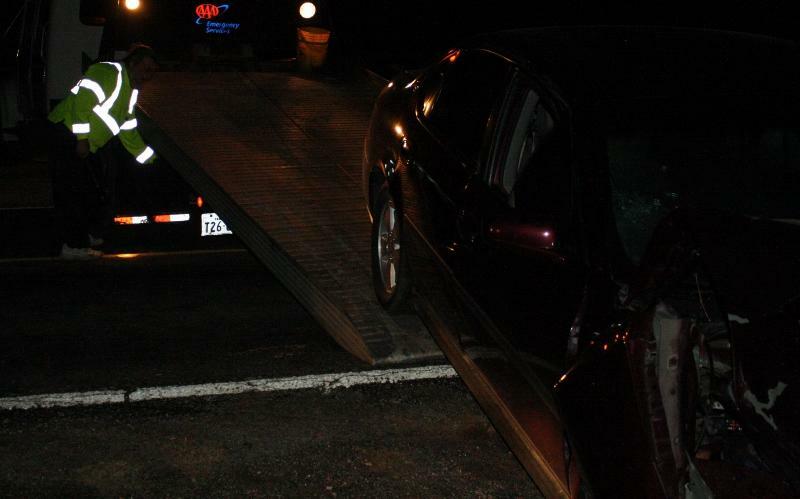 Robinson's vehicle was recovered by Ken's Towing. 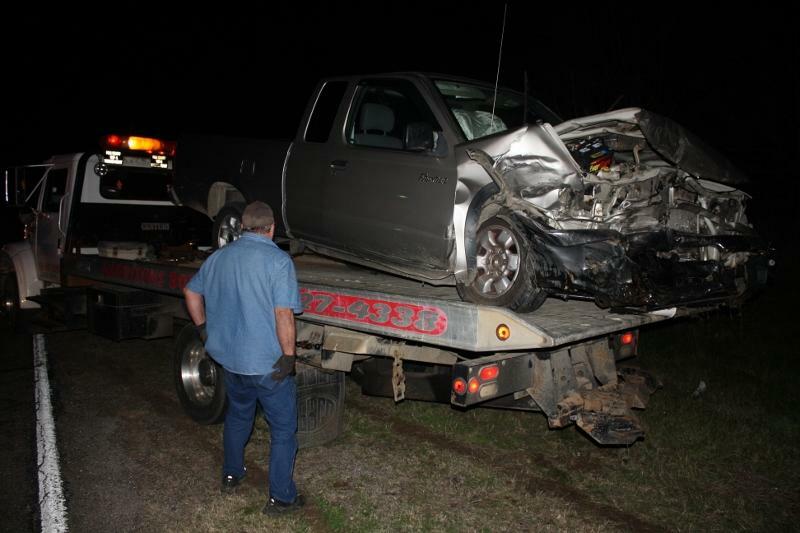 Flores-Reyes' vehicle was recovered by Big Jim Harwood. Houdini was in a grouchy mood.